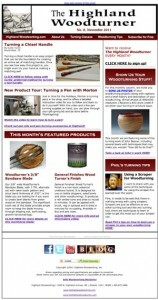 The November issue of Highland Woodworking’s monthly woodturning newsletter, The Highland Woodturner, is out! Curtis Turner has a new column on turning a chisel handle – so if you’ve got some great old chisels but are not particularly fond of the attached handle, turn your own! Curtis will show you how. We’ve also got a great pen-turning video demonstration from Morton, showing us just how easy it is to turn a pen. A great gift for the holidays! Top it all off with some great woodturnings by John Beaver in our Show Us Your Woodturning column, a new turning tip from Phil Colson and a couple of great deals on woodturning products! Happy Woodturning everyone – enjoy!